Not much time now, before we pack our van for Edinburgh Yarn Festival! We’re preparing some beautiful kits for the festival, to make shopping easier. This week we’re offering a free pattern for our new kit, Tiny Tassels! We’ll announce our prize winner of the Brown Eyed Susan pattern and Uncommon Thread BFL Singles, as well as offer a new prize giveaway for one of our Tiny Tassels kits! 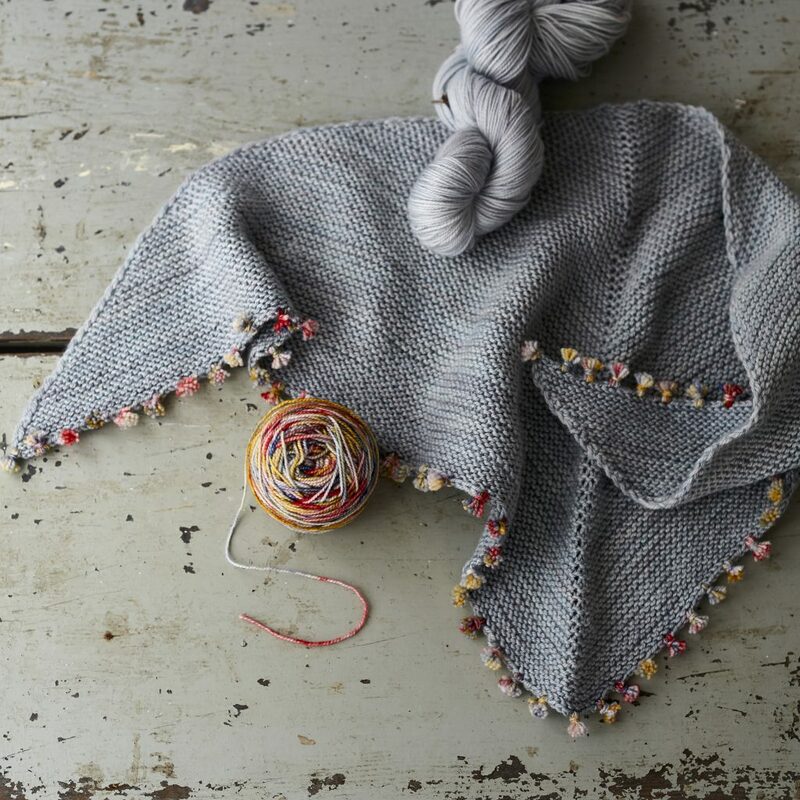 We’ve been working on this pattern for a while with one of our lovely Loopettes, Karin Fernandes. It’s a simple little triangular garter shawl, but what makes it special is the tiny tassels! We’ve written a photo tutorial for the tassels. Try making a few on a scrap piece of knitting, to help you decide the best number of wraps for yours. Make the triangle larger, using two skeins of yarn, or use a thicker yarn such as a DK. It’s your choice. The tassels are perfect for using up small ends of yarn, or purchase Madelinetosh Unicorn Tails mini skeins, for the colours of your choice. The first kit is Flamingo and includes 1 skein of Qing Fibre Merino Singles in Flamingo as well as Mini balls of Madelinetosh Unicorn Tails in Death by Elocution, Brass, Jade and Onyx, as seen above. Next we have Cuttlefish: 1 skein of Qing Fibre Merino Singles in Cuttlefish as well as Mini balls of Madelinetosh Unicorn Tails in Glazed Pecan, Death by Elocution, Brass and Antique Lace, as seen above. Finally, we have Smoke: 1 skein of Qing Fibre Merino Singles in Smoke as well as Mini balls of Madelinetosh Unicorn Tails in Glazed Pecan, Jade, Brass and Translation, as seen above. 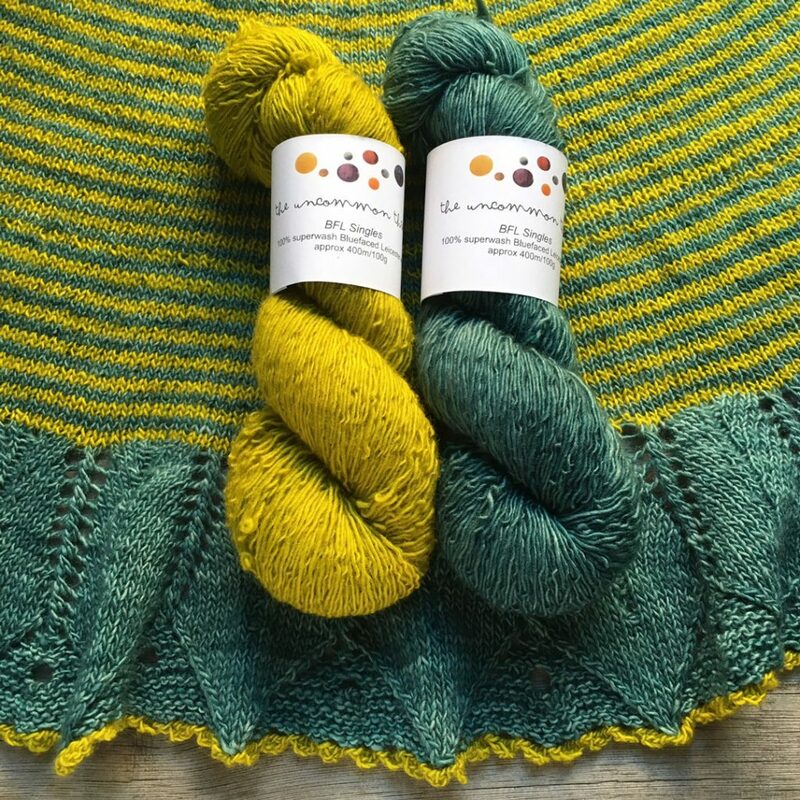 We have a very limited number of these kits available online now, but will bring a lot more to Edinburgh Yarn Festival, so find us there at stand E5. Loop will also have Qing Merino Singles in loads of other colours on our stand at EYF and we are pretty well stocked in the London and online shop right now. If there are any kits left after the festival, they’ll be available through our shop at the same great price. The kits also include a Loop cotton shopper bag and the pattern is a gift to all of you here now! We look forward to seeing your variations of this simple, but delightful shawl design. Tag us or use the #tinytassels so we can see all of your versions! Thank you to Ragnhild of @anotherknitgirl who kindly modelled for us while we shot one of her own patterns that is coming very soon. And of course huge thanks to Karin Fernandes @karinsaray for designing this little treasure. It’s made us all smile! This week (and every week before EYF) we have another prize giveaway! Last week we gave away a copy of our new Brown Eyed Susan pattern, with a skein of Uncommon Thread BFL Singles in Fjord and Avocat! The lucky winner is Nancy, who commented on the blog. Congratulations! We’ll be in touch to get your address. In celebration of our new Tiny Tassels pattern and kits, we’re offering a kit, in your choice of colour. There are two ways to win! You can do both, if you want to double your chances! Follow us on Instagram and either repost our image (above) in a post of your own (this is very important – it is not enough to leave a comment in our post with the hashtag, it has to be in a post in your IG feed), or use an image of your own, but be sure to tag it with #LoopEYF18Gift. 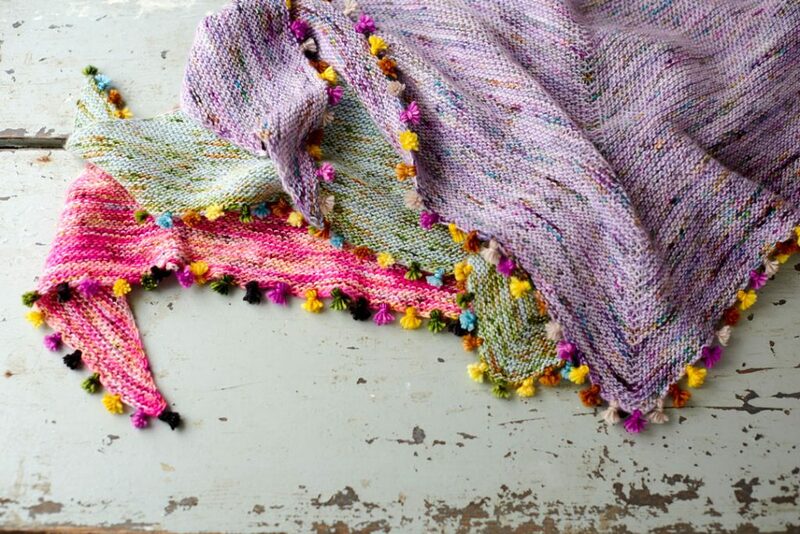 I absolutely love this shawl, the tassels really make it special and look fun to make . . . And that yarn !! 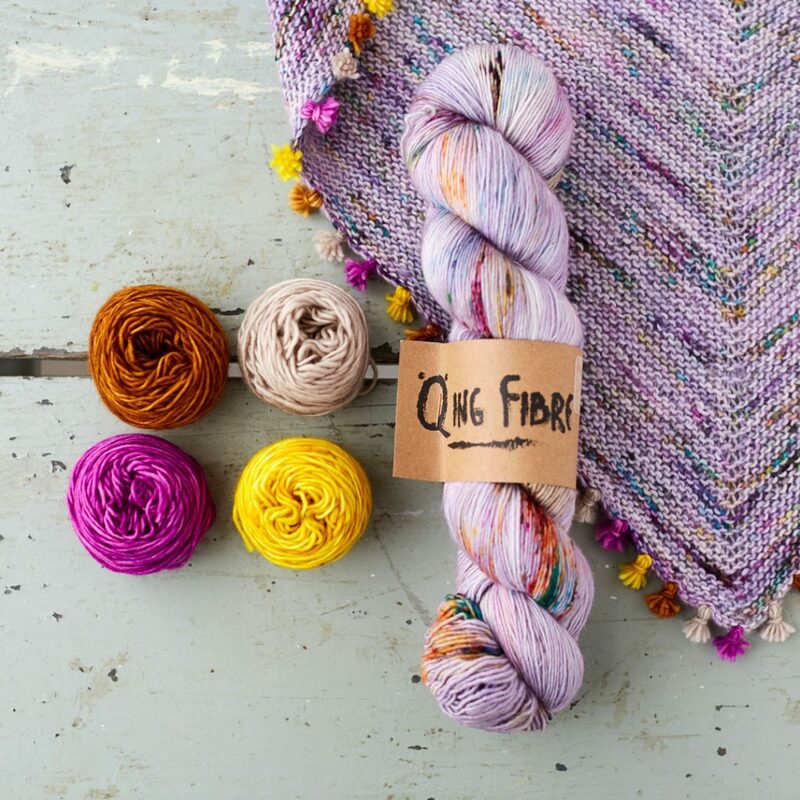 I would love to win this kit-what a pretty shawl. This is a great giveaway – I would love to win! Love ar first sight! Amazing how those tiny fringes make a basic pattern so interesting. I love this Tiny Tassels pattern. So different from other patterns. This is such a cheerful pattern,would brighten up any winter’s day! Hard to choose a favorite. They all look amazing and the tassels are so vibrant! Ich finde diese Idee absolut entzückend, dankeschön dafür! With over a foot of snow outside my window, this shawl is a beautiful pop of brightness and would be great in any of the colourways. Mmm cosy. I have been waiting for this, such a lovely cheerful pattern. Love all the kits especially Smoke. I love the wee tassles and the colourways. A lovely project! Oh lovely cuttlefish – intelligent and colourful creatures that they are – yet so rarely a knitting inspiration for some strange reason. Yes please. I am hibernation crocheting yet again today and watching the blackbirds and a thrush eating the crab apples from the tree outside my bedroom window. Such a simple but effective use of beautiful wool. 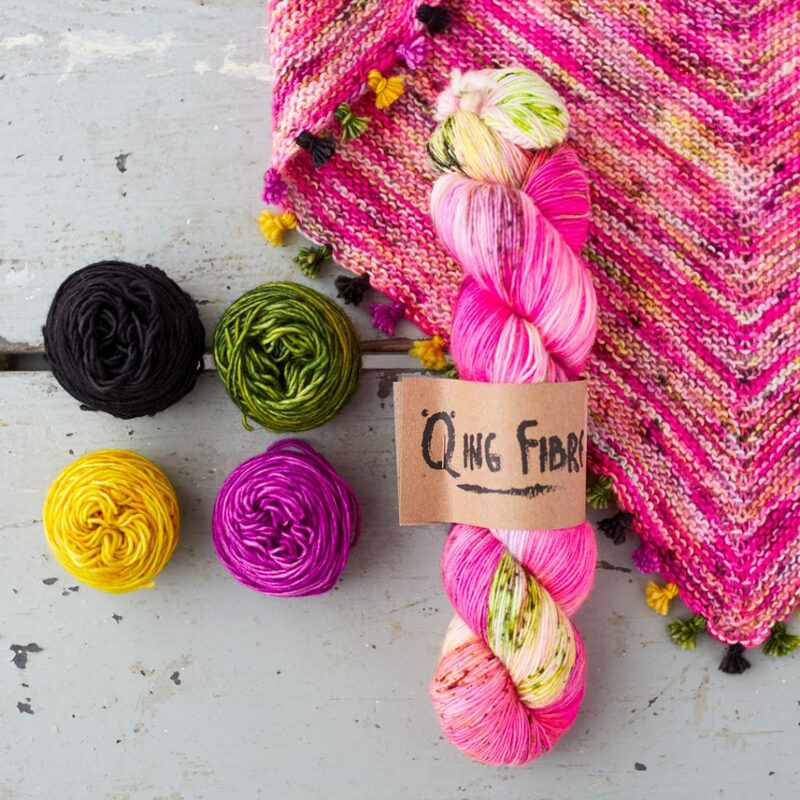 Such a bright and cheerful shawl! A simple but fun design, Smoke would be my choice if I win! Ideal project for a snow day! Tassels has captured my heart! Every time I look at it, it makes me feel happy inside. How much more to have a lovely kit and then wear it! Thank you so much. What a wonderful little shawl. It makes me dream and would be a great gift for a lovely old lafdy who teached me knitting. Cuttlefish would be my choice of colour. The shawl looks beautiful and would be so useful at all times of year. Such a lovely pattern, those tassels are the perfect adornment. Ooooh! Love this! Cuttlefish Please ! Tassels look great fun to make and so does the shawl. I would love to knit one in smoke colour way. My favourite is the Cuttlefish colour way and love the little tassels – they just finish it off a treat. That’s really beautiful – I particularly love the Flamingo colourway – so vibrant and warming. Definitely Cuttlefish! Thanks for the inspiration and tutorial for these gorgeous little tassels. Such beautiful wool. Great idea for using up bits and pieces of special yarn as highlights. Hurry up and pick me! This is such a fun, sweet pattern! Congratulations on another great knit! Pick me for the lovely! I would have tassels on everything! Joyous! Smoke for me please. That is the sweetest shawl, your patterns are just great. And the color choices! The best! What a lovely shawl, the mini tassels make it so much fun! Love all the colours! Such a simple and effective design. I would love any of the yarn colour combos! This is so beautiful, thank you for the kind giveaway! Here’s hoping! I have been stalking this sweet shawl! Thank you very much for the pattern!! This shawl! Sometimes the simplest knitted items with that tiny little unique detail are the most beautiful. And love all the color ways but especially “smoke!” Have fun in Edinburgh. Love how the tassels coordinate with the main yarn, such a nice touch! This is so cute! Love the little tassels! Really adorable! I think tassels could be the new pom poms! I love this pattern. 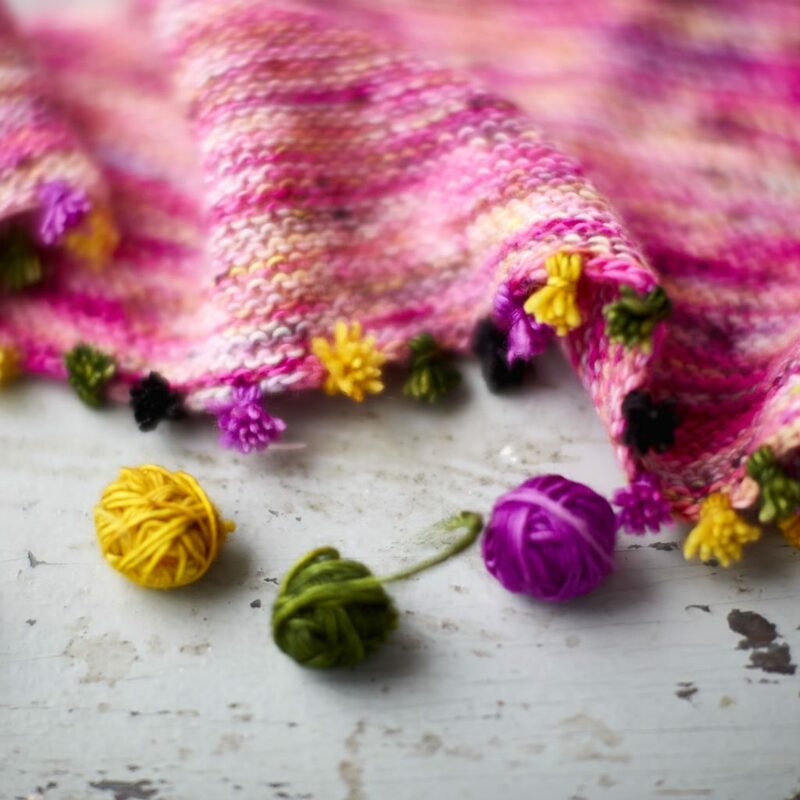 A small, easy and fast to knit shawl in wonderful colors that awoke spring feelings. And the little tassels are so cute; they conjure up a smile on everyone’s face. :-)) And the perfect additon is your tutorial. Well done. How fun! Perfect for transitioning to spring! Love it! The tiny tassels are so cute! I’ve always been a big tassel-fan so this is a big winner! Thank you so much for this free pattern and the tiny tassels tutorial!! I can’t wait to cast on for this lovely! It’s been a Winter for shawls … this one is gorgeous, the flamingo colour way certainly brightens up this raw, cold day. This is the perfect spring pattern I’ve been looking for! The tassels are so tiny and cute! Another beautiful pattern with lovely details! This kit is just too cute! I love the sweet tiny tassels and a year round shawl! Great play on colors. Clever little tassels! Entering the giveaway for the Tiny Tassel Shawl :) I Love the grey color with the bits of tassel colors! Oh I love this shawl! Cuttlefish, Flamigo, Smoke … impossible to choose! Such a cute shawl. Finally I know what to do with my many leftover scraps lying around. This is such a fun pattern! I love it in every color! Omg I love these!! I really love the lilac one and the ‘smoke’ colourway :) Gorgeous!! Those tiny tassels tho. Adorable. Love. Love the smoke colours, I have an addictions to shawls! I have an addiction to knitting shawls, would love the colour smoke. Smoke and vibrant unicorn tails! Great combination for this beautiful shawl. Thanks for the giveaway and for the pattern. The tiny tassels on Tiny Tassels makes me smile! Those tassels are just adorable! I want to cast on immediately. How gorgeous are these little tassels, they dress up a simple shawl beautifully. This is a lovely shawl and I am fascinated by the tiny tassels! Thanks for the chance to win! Such a cute shawl, the little tassels add that something extra to a lovely shawl. Definitely on my to do list! I’m definitely making this! The best use of speckled yarn I’ve seen. Love the qute tassels! And Cuttlefish is a beautiful colour. And I thought pom-poms were cute! I love the tiny tassels. I will try to make them soon! I love the tiny tassels! What a neat idea; just so cute! I’m so excited about these tiny tassels. The kits are lovely. This is the cutest and so unique! Love it, knit it,wear it!! The tassels weren’t my idea of a good thing at first, however, I have come to love them! They add some fun touches of color! The kits are wonderful! Flamingo is amazing. And the tiny tassels. I love the colors of this shawl! What a fun shawl and the colors your chose for the kits are great! Would love to win one. Love the cuttlefish colour. Love the shawl. Love the tassels – the whole thing is adorable! What a fun shawl to brighten a chilly winter day! Love it! I haven’t done tassels, I’d love to! These tiny tassels are so cute! The flamingo and smoke colorways are gorgeous!! The flamingo kit is amazing!! Would love this so much and would be perfect for spring! Such an intriguing little pattern! I would love to make it in any of the colorways! But I particularly love the smoke. Oh my! I love the cuttlefish. Or the smoke. Or the flamingo. Or all four! I just love this pattern! Thank you for sharing. I adore the Smoke colourway – can’t wait to come visit you at EYF, and thank you for the giveaway! I LOVE the Smoke colorway – it’s so spring-y green and refreshing! What a delightful pattern! It has just the right amount of bright color to cheer one up. I adore the Smoke color way, which is surprising, as they are not my usual colors. Simply lovely! I love the tiny tassels! They give great character and fun energy to the shawl. I love how the tiny tassels pick the speckles up in the main shawl. I think cuttlefish is my favorite, but I really like smoke, too. I have been waiting for this so long. it is beautiful !!!! Qing Fibre is my favorite. I love the Flamingo version. Bright colors are for me! I like something new and tassels are it. Great idea! Oh how gorgeous! They colours are rustic and beautiful! …and those tassels!!! Oh gosh, this is soooo beautiful!!! I absolutely adore the cuttlefish colours!!! This is perfect for layering at the end of winter and spring!!! Those tassels are ingenious! Love the color play! So beautiful. I would love to win this kit. How wunderfull. That tiny little tassels! just want to thank you for this lovely pattern! I would love to knit this, love all the colours! I just love this shawl – adorable tiny tassels! Smoke is to die for. Can’t wait to knit this! Lovely pattern especially the tiny tassels off to find out how to do them…. I am in love with Tiny Tassels! Especially, the tiny tassels! They add such fun color pops! I love it! Especially in the Smoke colorway. An interesting garter base yarn and those tiny explosions of color; too cute! This loop is soooo pretty! Hope I will win a kit! Sweet shawl, and a great way to add pops of colour. Thanks for the fun pattern. What a lovely little design, would enjoy having this! Perfect little scarf. I’m somewhat inexperienced with color decisions and tend to dither for months before plunging into a project… but instantly fell in love with this simple but striking design that looks so fresh and fun. Thank you for sharing this pattern. So beautiful shawl ..for my daughters this would be perfect! Oooo I love the smoke colourway! Lovely shawl and beautiful yarn. The tiny tassels are a charming idea! They look make the shawl look lively and soft. 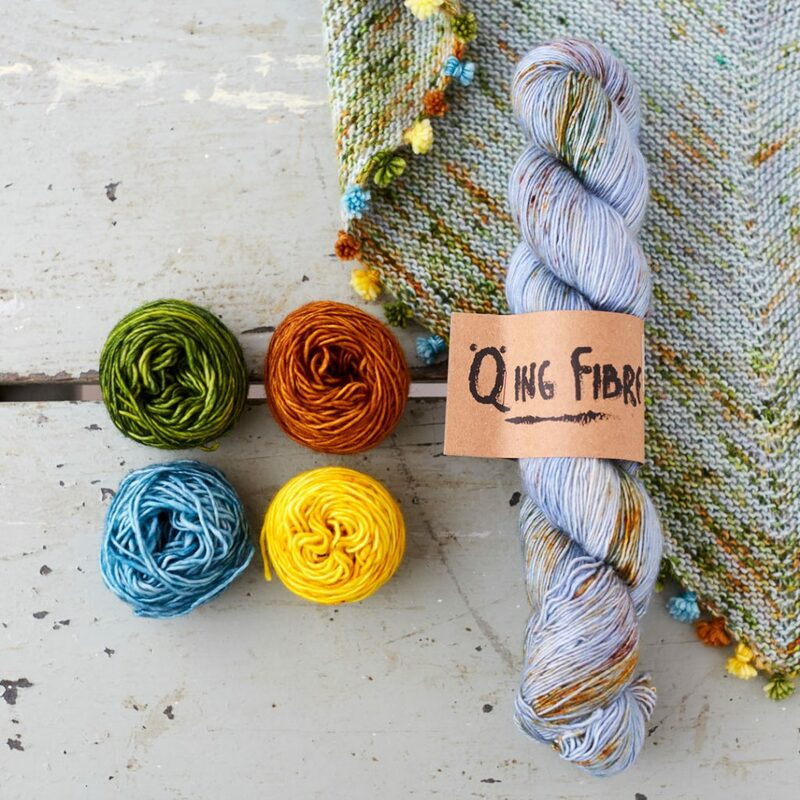 I would absolutely love to win this gorgeous kit in Cuttlefish for my mum- she missed out on the first batch online. Qing is my absolute favourite after visiting Loop London (beyond heaven!) and this pattern is so pretty. Thank you! A perfect spring shawl. I absolutely love those tiny tassels – beautiful! Please enter me to win the Tiny Tassels kit … Such a generous giveaway! Thank you. This shawl is adorable. I love it!!! Thanks for the chance to win! The yarn selections are gorgeous! Great detail! The tassels are adorable. I’m ready to take on tassels, and this is a beautiful way to do it! Stunning! Love the color ways just beautiful. Amazing that these simple elements come together to make such a statement piece! So hard to pick a favorite! This is the cutest thing I’ve seen in a while! I love it! So beautifully simple, yet such an eye catcher! I’d love to make one! Cuttlefish for me, please. Love it. I would love to win this kit – hard to choose one with such beautiful colors! See you in Edinburgh. Thank you for the pattern! Those tassels are adorable. I saw these in the shop today, all stunning and unique. I think Smoke just edges it for me. It is all about those tiny tassels, I’m in. This scarf is so cute and looks like a great way to use a special multicolored skein. 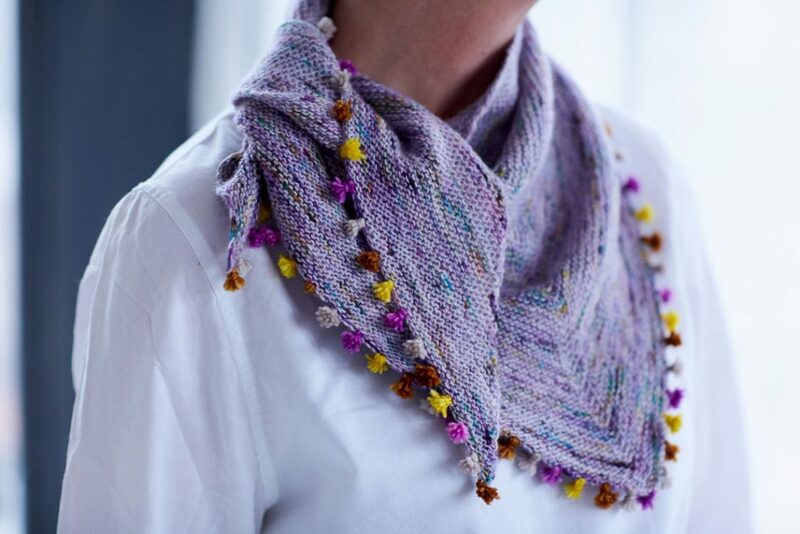 Thank you for the charming shawlette pattern – those tiny tassels and all the colour combinations, transform this into a fun project that’s perfect for Spring! Love this pattern and the yarn too!! 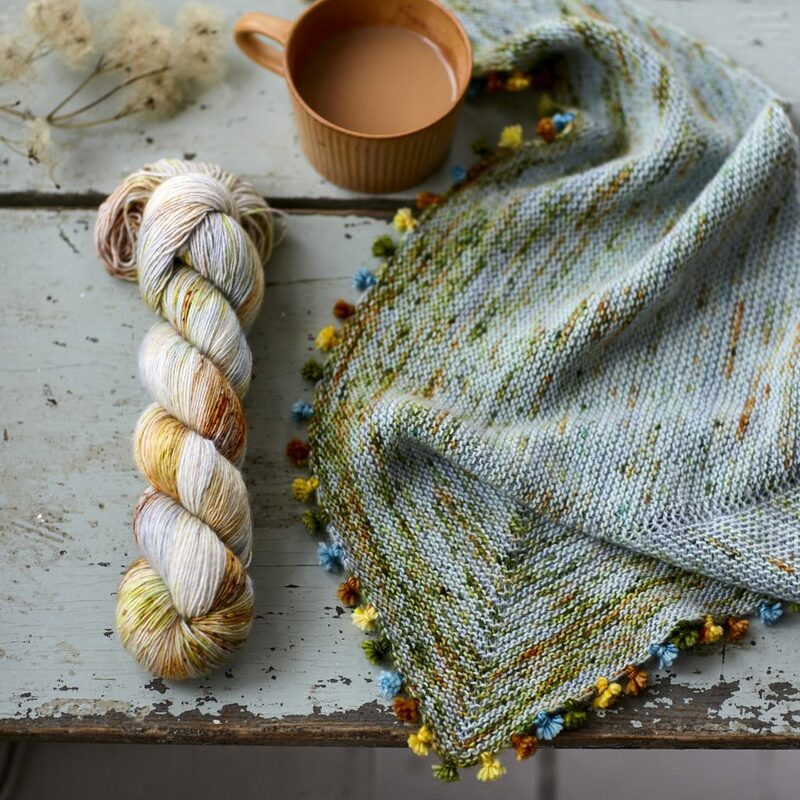 I would love to win this shawl kit. So very pretty! Sweet design. A great way to get lots of colors in. It will go with anything! Love, love, love those tassles, but love the look of the yarn too, such fab colours. It’s a lovely pattern…just love the tassels! Saw this shawl at the Wool Festival in Yellow Spring Ohio. I am a beginner knitter and would love to have this pattern. The tassels really make this special. Love it! Absolutely love this shawl. Saw it in an email from Koigu.